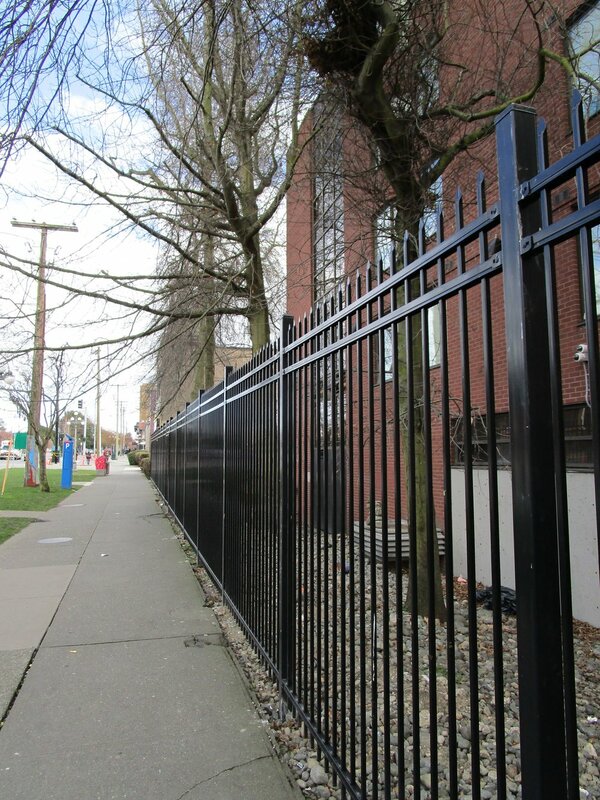 Crime Prevention Through Environmental Design (CPTED) is a city and VicPD-endorsed policy that recommends using fences, rocks, lighting, and surveillance to make spaces unusable or inaccessible to poor and homeless Victorians. Reports I’ve obtained through VicPD’s Freedom of Information system show that CPTED is not about “crime,” but about pushing people further to the margins. And the provincial government is an active participant. Fences “delight … the passerby.” If you say so, Victoria. Image source: "Guidelines for Fences, Gates and Shutters," prepared for the City of Victoria. When BC Housing put up a fence on Pandora behind the Portland Hotel Society (PHS) building (a.k.a. Johnson Street Community, or Central Care Home), they were responding to recommendations from a VicPD CPTED report. I asked for all of VicPD’s 2016 CPTED reports to find out what the police were telling people. After initially claiming that everything but the PHS report were “created for private citizens that were victims of crime,” VicPD turned over four reports they had prepared for provincial government agencies. All of the groups who apparently asked VicPD for these reports – BC Housing; the Ministry of Community, Sport and Cultural Development; the Ministry of Jobs; and the Environmental Assessment Office – have the ear of policy makers who could make real, structural change to provide housing and curb homelessness. Some people in these organizations are policy makers themselves. It’s disappointing that the provincial government’s response to visible homelessness and poverty is to call in the police to tell them how they can stop seeing it. After receiving “inquiries,” the police did a “Safety and Security Audit” of the PHS building in September, 2016.­ They said CPTED could “help reduce crime, improve safety and influence how people use the space.” The two-page report (plus pictures) is a lot of words about how to use metal, lighting, and surveillance cameras to keep people away. VicPD says the assessment was designed “to see where social disorder problems are occurring.” Another recommendation was to move a fence on Johnson Street to “address issues of trespassing, drug use, abandoned property etc.” by blocking off that area. The gaps in the metal bars are there in order to “maintai[n] natural surveillance into the property.” Anyone who manages to get through those fences won’t find any private space. 800 Johnson. Image Source: Google Maps. B.C’s Environmental Assessment Office told VicPD that “trespassing, open drug/alcohol use and drug paraphernalia/needles/feces etc. 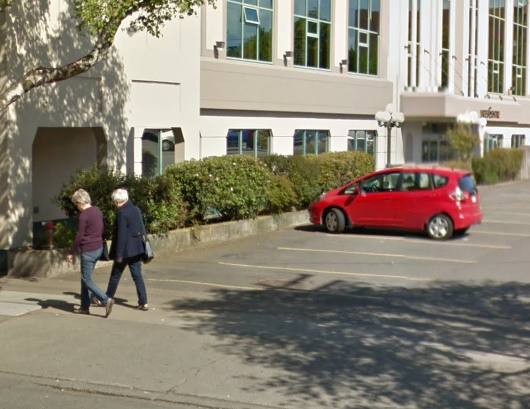 … is making some of the staff feel unsafe” at their 836 Yates Street offices. 836 Yates. Image source: Google Maps. Other suggestions included increasing LED lighting, installing no trespassing signs (presumably so that the police could enforce them), and employing “security patrols … to call police to report any trespassers, illegal activity etc.” VicPD said they did the report in response to staff concerns about ‘feeling unsafe.’ If any staff have been harmed then of course that’s not okay, but permanent displacement of everyone from that space is an extreme response. I would be surprised if those fears weren’t based at least in part on vague feelings that homeless people are inherently dangerous, needle phobia, and so on. At the end of the day it’s still a provincial government agency choosing to call in the police rather than confront the government’s own failings that have contributed to visible poverty and homelessness. If governments wanted to house people as much as they want to protect private property, they could do that. Instead we see a police response. A “No no trespassing” at the Environmental Assessment Office. VicPD says CPTED is a preventative measure to “reduce your chances of becoming a victim of crime.” But all of these reports, which were written within three weeks of each other, were about putting up fences, stopping people from sitting down, and generally making it even harder to be homeless in Victoria. The primary “crimes” at stake were loitering and trespassing. 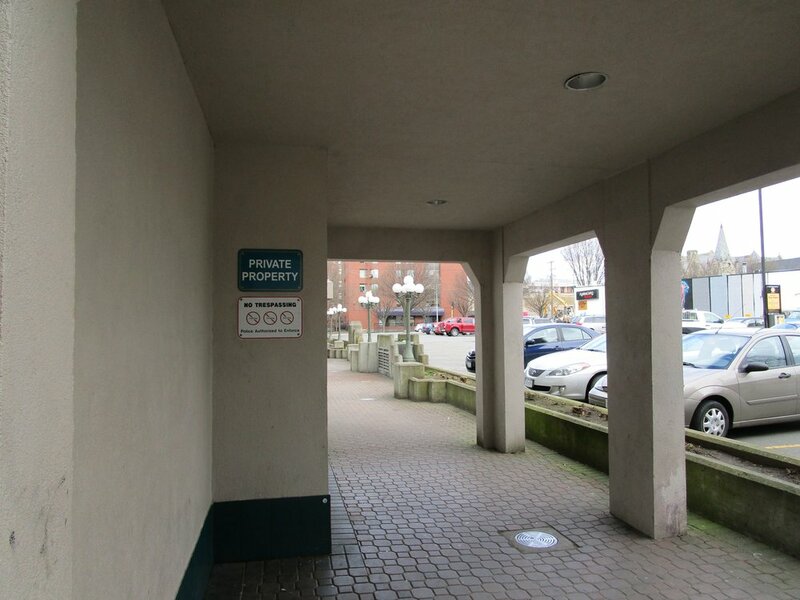 These reports make it abundantly clear that VicPD and the province, with the support of the city, are using CPTED to push people to seek out increasingly limited spaces to sleep, hang out, or use drugs. The failings of our governments’ housing polices brought visible homelessness and poverty to the provincial government’s doorstep, and BC Housing and other agencies turned to the police. They would have done better to look inward, and to their federal and municipal colleagues. The province should not support policies that push people to the margins and put them in real danger. *It’s not clear which ministry asked for the CPTED report, because the name of the person the report was sent to has been withheld. It’s possible the report was commissioned by the property company that owns the building; however, VicPD said they were happy to follow up with the “ministry,” suggesting that the province was directly involved in this CPTED report. The documents provided by VicPD also included a report on the Super 8 housing facility on Douglas, which I hope to write about at another time.